He needed the shower this morning. A long hot deluge of water to try to bring some life back into his body. Hell, it had been a hard few days, what with the aftermath of that fiasco in Northern Ireland and Ed’s peculiar behaviour. Alec still had no idea what the problem was, but Straker had isolated himself from everyone. Had ignored Alec and the rest of the staff, had come into work each morning looking haggard with tiredness, only to spend long hours alone in his office, dealing with paperwork, but doing very little else. Had refused all offers of help, or suggestions that he go home and get some rest, had been curt and abrasive and above all unconcerned about the ongoing state of affairs in his headquarters. And that worried Alec Freeman more than the obvious signs of exhaustion, or the dulled eyes, or the silence. Apathy was not a word you would ever associate with Ed Straker. A clear indication that something was very wrong. But Alec was now determined. This morning he would confront his boss and find out exactly what was going on. Last night’s local newspaper, folded and unread, was on the breakfast bar and with careless eyes he glanced over the front page, his first mug of coffee in his hands, toast on the plate next to his elbow. The usual unsuccessful attempts to instil some drama into mundane and unimportant happenings. Bold headlines glorying in the collapse of a local holiday firm with stranded travellers in Majorca. A mirthless grin twisted his lips. Bad news always made good copy. The reporters would be happy. Keep them occupied for a couple of days no doubt. Pictures of unsmiling families waiting in a crowded terminal for a flight home. No doubt followed in a couple of days by extravagant details of the traumas suffered. Tough. At least they had had a holiday. It was too long since Alec Freeman had managed a decent break away. Perhaps that was what Ed Straker needed. A few days away from SHADO and all its problems. He would suggest it to Ed this morning. If that was, he could get to talk to the SHADO Commander without getting his head snapped off. He folded the broadsheet to read the smaller news items on the front page, then stopped, appalled, the morning’s sparse breakfast ignored as he read, lifting the paper up as if by that simple act of reading the words more closely he might make them untrue, might make them disappear. But no. The words remained. There. On the page. And suddenly everything fell into place. Alec fumbled for his keys, desperation making his fingers clumsy, thick and unresponsive. Then he was out, hurrying down the stairs, out to his car, starting the engine and fastening his seatbelt only when the interior alarm warned him of an imminent shutdown if he didn’t comply. He focused on driving. His responses as automatic as ever, slipping the car into the stream of traffic with precise efficiency, glad to have something to concentrate on other than John’s face on the paper that lay beside him. A face that he was familiar with, that he saw every day at work. Blue-eyes, blond hair, the fine bone structure. A youthful Ed Straker, a boyish version of his father, with the same smile that was so rare, so seldom seen on the older man. It was a bright morning with cloudless pure skies, crisp shadows, holding the promise of more good times, hot sunlit days, warm nights. Alec Freeman carried the newspaper in a clenched fist, He ignored the world as he strode from his parked car, ignored the receptionist with her false smile and fake eyelashes, and he ignored Miss Ealand. The office door slid shut and he dropped the newspaper on the desk to pick up the box for the necessary Voice Print Identification scan. Unwilling eyes glimpsed the small article that leered out, its sentences accusing him with every word, every letter. He could not help but read it again, although it was burned into his mind. And Alec Freeman closed his eyes in despair as the office descended. Shado was quiet. No one commented on his drawn expression as he approached Straker’s office. The door was closed. He hadn’t expected anything else, and he stood there, unsure, almost too distressed to go in and face Ed Straker, to have to confront him with what had really happened just a few days ago. The truth. There in the newspaper. The office door opened and he took that first soft and hesitant step, across the threshold, into Straker’s office. What could he say? Comfortable platitudes. That was all. Meaningless empty words. But he had to know what had happened. ‘Alec?’ Straker gave his second in command a brief and questioning glance before dropping his head down to stare once more at the folder open in front of him. ‘Ed?’ His voice sounded too loud, too abrasive in the sullen silence. He stepped forward and tossed the newspaper in front of his friend. Alec watched bewildered as Straker folded the paper and pushed it away from him with almost casual unconcern. The temptation to grab the paper, to shake it in front of that expressionless face, to grab Straker by the shoulders and shake him as well was overwhelming. Anything to get a reaction. To break open that steel cage of dishonest indifference that surrounded Straker. ‘For God’s sake. What happened?’ It was too late to back down. He had to know. Had to get an answer. Even though Alec feared that answer more than anything else he had ever feared in his life. His body shuddered with the chill of memory. The events of that day. That look of sheer horror and despair that had flashed across Straker’s expression after Alec had diverted the transporter. What had he done. Dear God, what had he done? ‘Car accident. He died. That’s … all.’ Curt words. A sharp nod. Another folder opened and studied with unseeing eyes. Without further comment Straker’s hand reached out for the intercom in an attempt to dismiss his unwelcome interloper. Alec Freeman moved. Grabbed, held, gripped as if his life depended on the contact between his own hand and that slender wrist that was now immobile in his fingers. He could feel the trembling in the arm beneath his own clenched hand, the loss of resistance, Straker’s resolve failing with every pulse that throbbed through his body. A frozen moment, with two men trapped in time. Alec stared. Hard. Into those blue eyes that were trying to avoid his gaze, those eyes that were full of suspicious brightness, eyes that looked past him into the distance. A face that seemed, to Alec Freeman, full of cold hatred. Hatred of him? He tightened his grip and felt Straker wince under the pressure of his fingers. ‘Don’t you dare. Don’t you dare cut me out like that. I have the right to know. Damn it Ed, I need to know. What the hell did I do? It was my fault wasn’t it?’ he growled, the words rough like sandpaper, raw in his throat. Letting go of Straker’s wrist with a sudden jolt he turned away to pace the room, unable to sit, unable to watch Straker’s face with its dead expression. A lifeless expression without joy, without hope. Nothing. ‘You’re exceeding your privileges, Colonel. Yes, my son is dead. My son is dead. How I deal with that is up to me. Right now I want to deal with it in privacy … Alec … go! Please.’ Straker whispered, although Freeman was too angry to notice the subtle hint of pleading in the desperate voice. ‘No. I won’t. We need to talk. Why couldn’t you trust me enough to tell me?’ Alec shouted, rage flooding through him as he turned to slam his fist on the desk before resuming his restless pacing. Alec felt the chill run through him, felt his heart miss a beat, and a heart-stopping ache at the realisation of what had happened. He leaned on the desk, his body trembling with the loss of energy. ‘Oh God Ed. It was my fault then. John is dead and it’s all my fault.’ It was an effort to even remain standing. Despite Straker’s protestations, his attempt to comfort his friend, Alec would not be comforted or reassured. For Alec knew. Knew that he was, in part, to blame. That his decision to divert the transport had killed a child. Straker’s child. Ed’s son. John. John. A knife plunged deep into his gut, the pain agonising, unbearable. He stepped away once more. Away from the picture of John that still watched him, accused him, followed his every move. ‘Ed. I had no idea. I wondered at the time why it had taken off early. Dear God, John would be alive now if I had asked. How can you bear to even look at me.’ His voice cracked, betraying him even now. ‘Cut it! …. please.’ Straker’s voice sliced deeper into his guilt. ‘You aren’t responsible. I am. I didn’t tell you. Not when he had the accident. Not when you redirected that plane to Ireland. You and I both know that I had no business using it. It would have been a case of court martial for both of us, else, given that renegade alien. No, Alec. These things happen.’ the voice softer now, but still Straker wouldn’t meet his eyes. The knife dug deeper, twisted even harder, ripping and tearing and slicing through his very being. Yet somehow, as he stood once more in front of that barrier between himself and his friend, restless and trapped by his fears, he managed to admit the truth with words that burned as he spoke them. ‘That’s rubbish! These things don’t just ‘happen’. I am to blame. We both know it. You’re just trying to make things easier for me. As for a Court Martial.? No way and you know that as well.’ He shook his head with anger. There. Said. There was nothing else left now. Alec Freeman waited, heart pounding, for a look, an acknowledgement. Something. He watched as Straker, moving as stiffly as a puppet, stood up and dragged his jacket from the back of his chair. Alec could see the effort that was involved in the simple task of shrugging into it and fastening it up. ‘Let’s go for a walk, Alec. Somewhere more private.’ Straker looked up at last. Acknowledged his presence with eyes that seemed to look through him, as if he could not bear to admit his presence. ‘More private than here? Why? What are you hiding from me? Or is it that you simply want me out of here.’ It hurt so much, that jagged knife edge of blame, of separation, of knowing that he had lost his friend. And yet, how could he ever have expected Ed to behave towards him after what had happened. How could he respond? And then Straker looked at him, and the blue eyes stared without blame. Alec could see the hurt, the anguish deep inside Straker, but not hate, not condemnation. And he felt the first tiny spark of hope. ‘I’m going into the park. You can either come along, or not. Have it as you will. I need some fresh air.’ It was unspoken plea for companionship, support, help. His eyes tracked Straker as the commander walked out, not looking to see if he was being followed. Alec shadowed him, without conscious thought, without a moment’s hesitation as if bound to the other by more than friendship and the responsibilities of work. The park, fenced and secure, was deserted in the oppressive heat. Sweat prickled on his face, and he wiped his forehead before unfastening his jacket. He looked ahead, to where Straker was now standing, back to him, hands still clasped behind him. Shivering, as if it was a chill winter’s day, despite the jacket that wrapped around him like a barrier. Alec stood silent and patient, not knowing what, if anything, to say. There was nothing to do but wait until Straker turned to face him. The movement was hesitant and slow as if Straker was unsure of Alec’s reaction. Eyes met. ‘John liked the park. We were horsing around with the studio’s old fire engine on that day.’ He was still shivering as if colder than ice. ‘When he last visited? Was that………..’ Alec stepped forward, then halted. Unsure, unwilling to step into that circle of isolation that surrounded Straker. ‘Yes. It was.’ Shivers wracked through the slender figure standing there. The sunshine was too much to bear. Alec ripped open his jacket and tugged it off with harsh jerks. The heat. The words. Burning. ‘But he’s young, he’s ,… he was healthy. 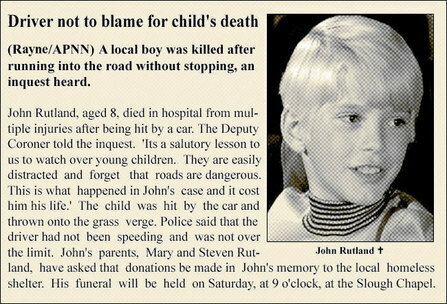 Young kids can survive some pretty bad accidents. What happened? What did that transporter have to do with it?’ his mouth dry, his lips stiff and reluctant. He had to listen hard to hear the whispered reply. Alec could feel the blood leave his face, could feel the same chill that Straker was experiencing shudder through him. He could hardly speak. His throat dry, thick. ‘Oh god,. that was what it was carrying. And I delayed it. Ed,… ………’ he turned away in distress. Freeman spun round, his face now flushed with anger and more than anger. With returning guilt. Alec watched as Straker shrank, the broad shoulders dropping down in a posture of exhaustion or resignation that would be unnoticed by anyone else. And Straker looked up at him, looked deep into Freeman’s eyes. An unspoken plea to be left alone. But Alec would no more leave Straker than he could have diverted that transporter had he known what was depending on it. Straker shivered again, wrapping his arms around himself as if to prevent Alec getting closer. He was unprepared for the contact. The embrace. A close, tight hug. Ed’s arms holding him, strong and still, not shivering now, arms that enfolded him in love, in warmth and understanding. Heads together, all thoughts of guilt, of blame crushed out of existence. ‘Ed. I am so so very sorry. I wish…………………………..’ he tried, he wanted so much, to say more. But what could be said? Alec nodded in reluctant surrender as Straker looked around at the empty park as if seeing a small boy playing there in the far distance. He had been awake for some time now, Lying there staring up at the ceiling. Wondering. Imagining Ed lying awake as well, if he had actually managed to sleep at all, that was. Sunshine crept through the gaps in between the curtains, its brightness accusing him. He didn’t want to get up, didn’t want to do this, and in fact he hadn’t been asked to do it. But Ed was his friend. And if Ed Straker wasn’t allowed to attend his own son’s funeral then Alec Freeman was damned well going to be there in his place. On a day like this it should be dull, it should be raining, heavy sloughing rain that chilled one, that hid the tears. But it was sunny and fresh and bright. It was all wrong. His uniform hung behind the door. Pressed and ready. It was too early to get up though, yet he could not bear to stay in bed any longer, could not lie there looking at the bland ceiling. He flung the covers back. Later, dressing with thick fingers that fumbled with buttons and tie, he thought about the day ahead. Would they recognise him? Would they make a scene? He hoped not. For John’s sake. His stomach rebelled at the thought of food; a cup of coffee, half-drunk, was all he could face in the end. With a sigh of relief and yet reluctance he eased his seldom worn jacket over his shoulders, fastened it, tugged it straight. Picked up his hat. Closed the door behind him. His Rover was the first in the carpark. He sat there, the engine idling, air conditioning keeping it cool inside. Despite the early hour, the heat was already threatening to get worse. He was glad he had parked in the shade. He waited, listening to the radio, thinking about Ed. About John. The cortege arrived without him noticing. It was just there all of a sudden, the long black hearse driving past him, tyres crunching on the fine gravel, before pulling to a halt outside the open double doors of the small chapel. Alec stared through the windscreen as the small, pale coffin was lifted out, placed on a trolley, wheeled inside. An obscene travesty. That tiny casket should have been carried on shoulders into the cool dimness of the chapel. His shoulders, Ed’s shoulders. Even Stephen Rutland should have had his own part to play in John’s final journey. Angered and more than a little distressed by the thoughtlessness shown, he watched from the obscurity of his vehicle as the small crowd followed behind the little procession. It should never have been like this. It had been years since he had last been inside a church, but the familiar routines came flooding back, and there was some small comfort to be had in the gentle words from the priest. The phrases he had learned as a child returned to him, and eased the jagged pain of that empty place next to him, the prayer book lying unopened, unused. Ed should have been here. Even if it was only to stand here, at the back of the church. It was his right, his last gift to John. The only thing that he could have given. His presence here, today. The service ended, the congregation stood. The coffin was wheeled out again, so small, so insignificant. A single wreath on top. Ed had not been allowed to send a tribute. Had been ordered not to. Alec kept his head lowered as John passed by, as one wheel on the trolley squeaked a gentle note of rebuke, as John’s mother sobbed and leaned against her husband. They did not see him. They did not see anyone, other than the small casket that preceded them. The grave was waiting. Open and dark, earth piled up next to the hole and covered with cheap grass material, as if trying to hide its purpose. The soil waiting to be dropped heavily onto that seemingly fragile coffin that was, even now, being lowered down out of sight, out of this life. No headstone, not yet. Alec stood out of the way, half-hidden behind the comforting bulk of the funeral directors wearing their thick black overcoats, even in this heat. Apart from the other mourners, but still part of them. No one looked at him, no one frowned at his presence, as he stood bare-headed, muttering to himself the familiar words that filled the silence. And, at last it was over. The final thump of soil on wood as mourners dropped their handful of earth, one last rose falling from Mary’s numb fingers down onto her son. As if awaking from sleep the people around the small grave began to look up, to move away, and to talk in quiet voices to each other. Alec remained alone. Silent in the hot sunshine. The last car drove away, but he lingered there, under the shade of the trees, leaning against the stone wall. There was no rush. Ed would be here soon enough. Well before the grave was due to be filled in, he had made sure of that. And so, patient, still, he stood there, thinking back over the years and wondering what the future would bring. A car. In the distance. Alec stepped out into sunshine and brightness to greet his friend with a sad smile of welcome. Alec paused, wondering whether he should lie, but Ed had the right to know. It might be of some comfort to him to know that Alec had been there, even if he himself had not. ‘Since nine,’ he answered, his voice as casual as possible. Straker was silent as they walked on. Then, ‘Thank you,’ he said. As they reached the grave, the first leaf of autumn fell to the ground behind them, golden in the sunshine. I hate Question Of Priorities. Well, I used to hate it. It was Guina who finally persuaded me to look at it with more open eyes and to see the brilliance of Bishop’s acting. Let’s be honest though, that initial scene with John and Straker messing about with the vehicles in the Harlington Straker studios was not the best scene! The music was enough to put anyone off. But, when you actually got over that, Q of P had a lot going for it. Not least of which was the quality of the acting, not only by the boy, the old lady and the very very creepy alien, but also by the regular cast. Keith Ford, quiet, focused, competent. Alec Freeman, puzzled by Straker’s somewhat detached attitude, and of course Straker himself. Distraught, desperate, despairing. Such superb acting. And such poignant moments. An actor who could convey so much simply with a look or a clenched fist. The episode left too many unanswered questions though. What happened afterwards? How did Straker cope? What did Alec Freeman do when he discovered that John had died? I wanted a sequel! Guina and I had discussed this episode on several occasions and the idea of doing the conversation as joint story seemed worth exploring. We started it as a conversation with directions included , how the speaker was feeling, how the words were said, but it was too slow and lost its spontaneity and immediacy. So we started again after writing only a few lines of dialogue. And this time we wrote just the words that were spoken by our character. Not knowing how the other was going to reply, not having discussed the story beyond where the conversation would begin. Boy, it was hard going. But it worked. It is ‘from the heart’ as it were. I hope we managed to capture the essence of how each of the two men would have felt, would have reacted if that conversation had taken place. And I have no doubt that it did in fact take place at some stage. Alec Freeman was too smart and too attentive not see that something was terribly wrong with Straker. Once he had worked out what had happened to John and how the transporter had been involved, the guilt that Alec must have felt would have eaten away at him and he would have had to face Straker. Would Straker have been able to forgive Alec for what had happened? I think so. But whether Straker would ever have forgiven himself is another matter altogether. So, once the dialogue was down, with no corrections , no ‘tweaking’, no editing , we each wrote our own story, using that dialogue between the two men as the basis, but adding our own character’s personal viewpoint. Two writers, two stories, two points of view.